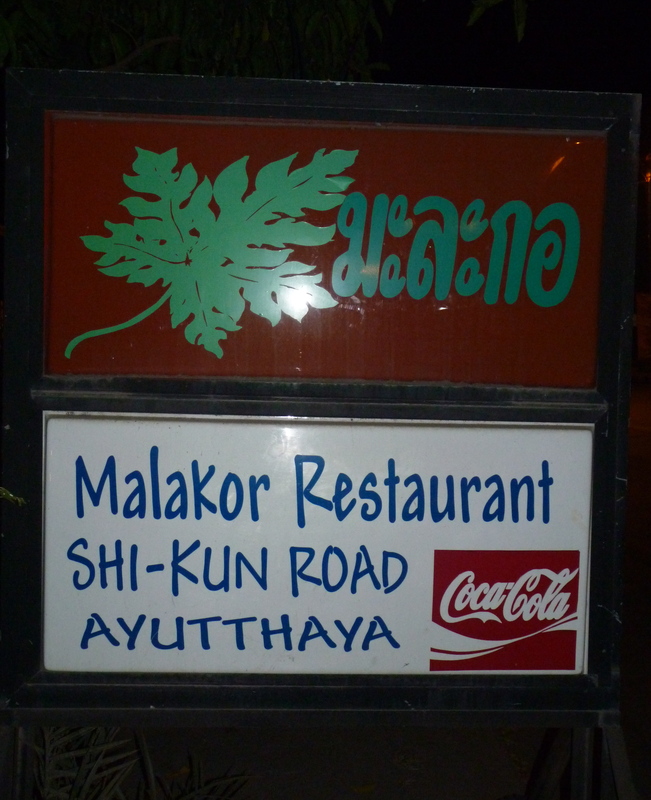 Tonight, we headed to Malakor for dinner. This seems to be a trend when we are unsure on our dinner plans. Malakor is a very modest Thai style restaurant. There are never more than 8 diners sitting cross-legged on the floor, and yet they serve the best Thai food in Ayutthaya. Malakor was our first meal in Ayutthaya and has been a weekly occurrence ever since. 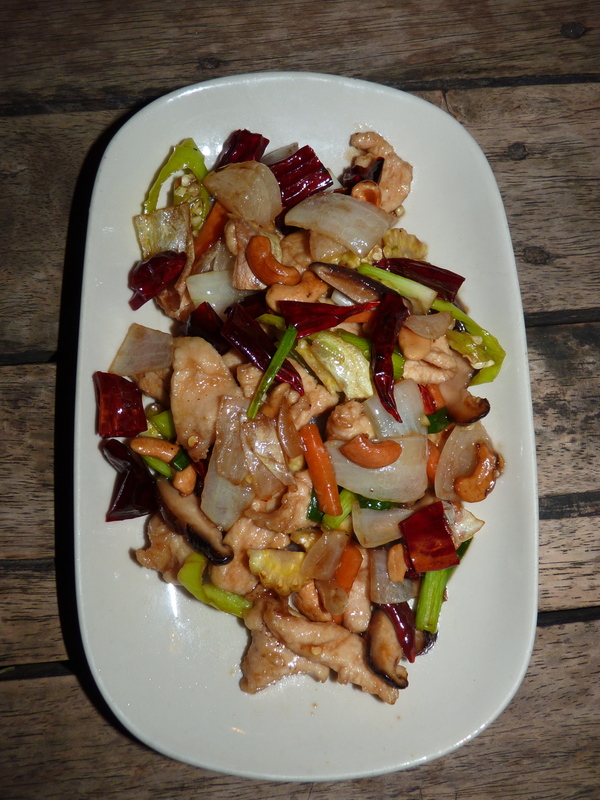 One dish that has become a staple for me in Thailand is Pad Med Ma Muang, or Stir-fry chicken with cashew nuts. It seems that the more I order the dish, the better it is. Either each restaurant I go to makes it better than the last, or I just cannot go a week without the combination of warm crunchy cashew nuts with caramelized onions. I’m going to go with the latter. Malakor’s take on the dish uses dried red chilies instead of fresh, giving the dish a smoky flavor. The stir-fry also includes sweet green peppers (similar to banana peppers), carrots, green onion, baby corn, and local mushrooms. Ma Muang, meaning mango in Thai, could be one of the reasons the sauce is so flavorful, but with the communication barrier, I am not even sure if mango is used. Even if can’t figure out the exact ingredients, mai bpen rai, I know my fix is just a five minute motorbike away. I am aware that my blog must look like an advertisement for Malakor, but if you ever find yourself in Ayutthaya, it would be worth it to eat multiple meals in this hole-in-the-wall spot. I am the opposite of a picky eater. I’m no Andrew Zimmern, but I’ll basically try anything. Soup, however, has just never been my cup of tea. I like foods with multiple textures and soup tends to get boring. Or so I thought until I had my first bowl of Tom Kha at Malakor. On our first trip to Malakor, Sean and I split Tom Kha and another main dish. By the time the second course came out, we had both our spoons in the Tom Kha bowl, fighting over the last few sips. We were more than tempted to order a second bowl. Tom Kha is a coconut milk-based soup and has similar flavors to Tom Yum (a popular spicy Thai soup). 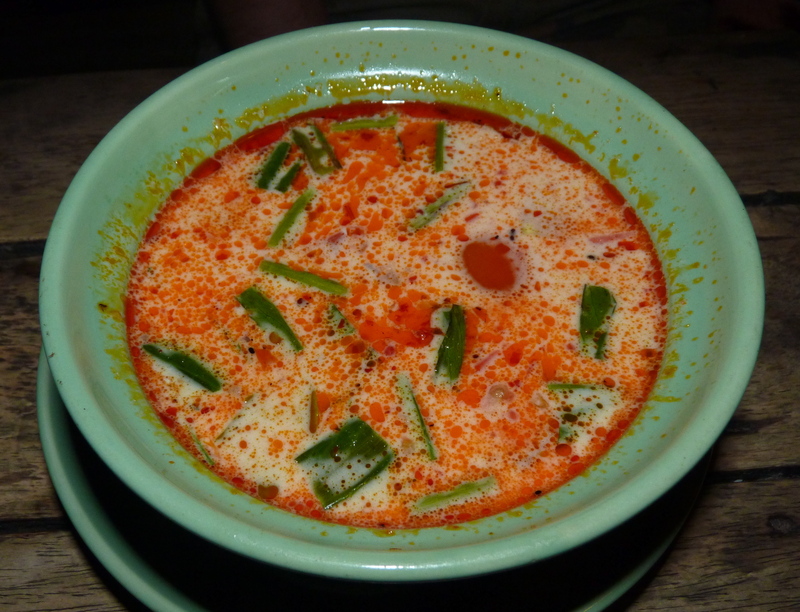 The coconut milk is slowly cooked with large pieces of galangal (Thai ginger), lemongrass, red chilies and bay leaves. The mushroom, tomato, onion and shrimp are added with a few minutes left to cook, allowing the liquid to reduce and for the flavors to come alive. 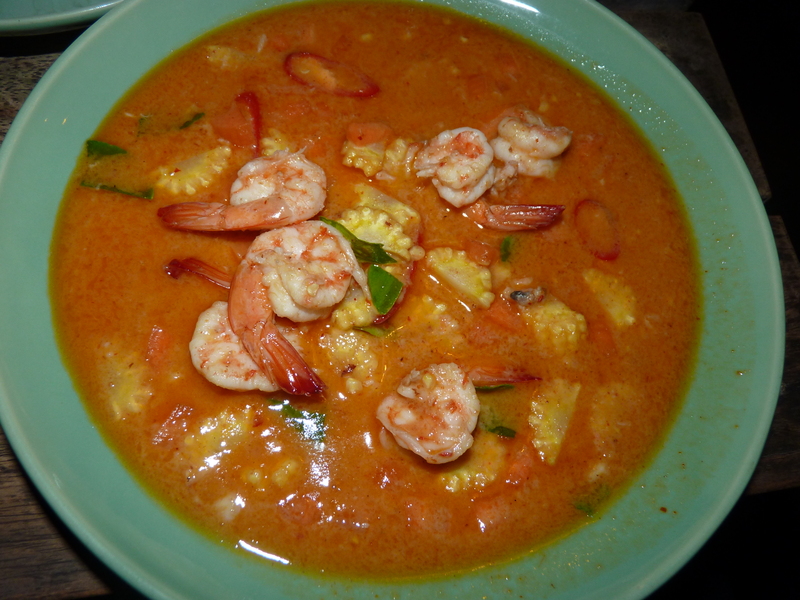 Another Malakor crowd favorite: red curry with shrimp (featured below). Wow this makes me really hungry. Especially the Tom Kha! I loved eating at Malakor and especially the chicken and cashews. If you have a free weekend day, you should ask them to let you have a cooking lesson so you can bring these dishes home…to me!! Love the new look of the blog! And now I am salivating! Yummy! do check out my other recipes too.